After the existing Retainer Wall was hauled away, we began the dig out for the new Retainer Wall and Concrete Step Design. Approximately 7 foot was taken out for the Retainer Wall and Step Design, and backfilled with gravel. 12 inch Split Faced Cynderblock Wall tied in with 2 foot returns, layed on an 8 inch rebar reinforced Concrete Footer that is set at the frost line. Decorative Retainer Wall and Concrete Steps finished with Cut Sandstone Coping. This old concrete driveway was demolished and hauled away, then we dug out four inches and set the subgrade for the driveway. We brought in the 2b limestone, spread 4 inches thick, and compacted the subgrade. We then poured 4 inches of concrete reinforced with wire mesh. Rosebud Picture Frame Finish. 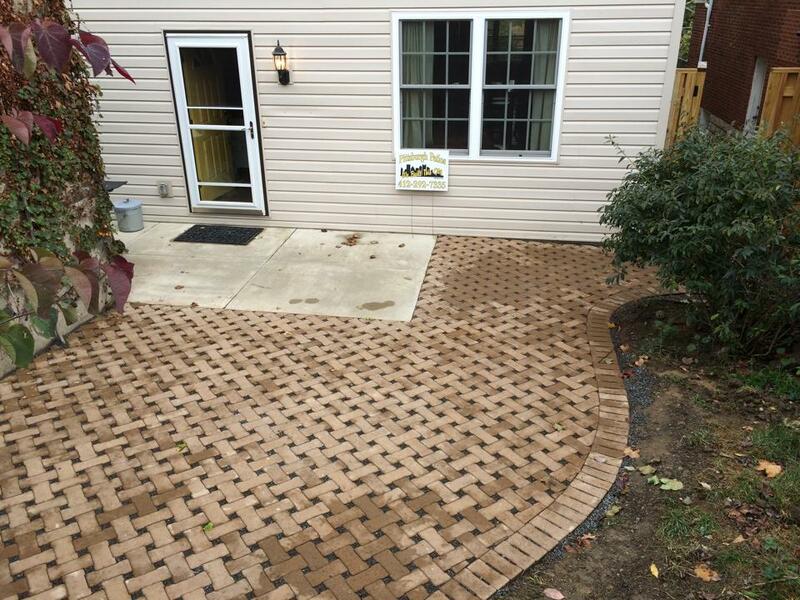 This Eko-Tek Permeable Patio was to be an asymetrical design. 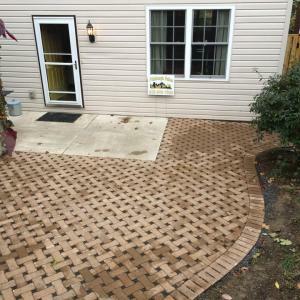 We designed then excavated the Permeable Patio site. This Project required a 4 inch 2b modified limestone compacted base, we used a 1 inch layer of sand to lay the Permeable Pavers. Once everything was cut and layed we filled the Eko-Tek Permeable Patio with 1a crushed limestone. Natural Flagstone Patio to match existing patio shape. This Patio was dug out for footers at the frostline, 10 inch cynder block with a 4 inch reinforced concrete pad. Foundation Walls that are above ground where faced with Cultered Stone Veneer. The Concrete Patio Was finished with Natural Flagstone. With 15+ Years experince Frank Harp Owner of Pittsburgh Ptaios, Inc. guarantees your project will look awsome and last through the elements for years. We welcome your questions and inquires. Please see our Contact Us page for complete contact information. Copyright 2014 Pittsburgh Patios, Inc.. All rights reserved.